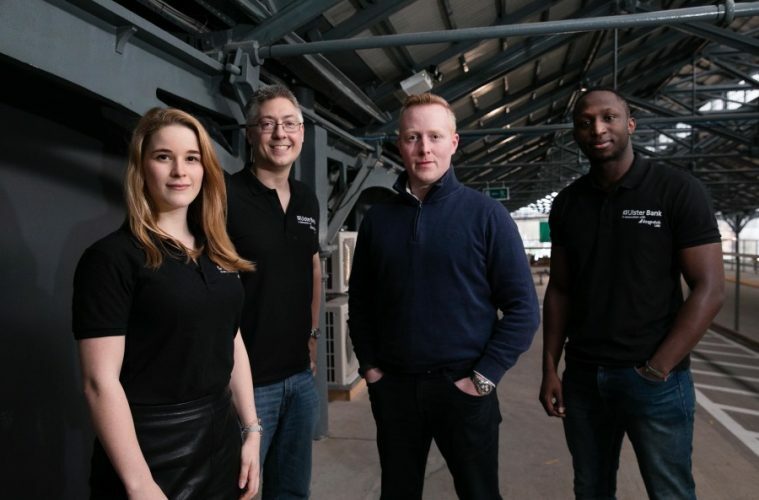 Pictured are Ulster Bank CAO Ciarán Coyle (second from right) and the winning team Petrichor (Fabia Howard-Smith, David de Neise and Emmanuel Abodunrin) for their home buying concept to help customers throughout the lifetime of their mortgage. Pic Orla Murray/ SON Photo. Petrichor were announced as winners of Ulster Bank’s 2018 Hackathon at Dogpatch Labs in Dublin’s CHQ last night, with their idea to help home buyers throughout the lifetime of their mortgage coming out on top. Around 150 coders, developers, designers, businesspeople and entrepreneurs came together for the annual sold out event to ‘hack’ ideas in the spirit of collaboration and open banking. The objective of the three-day banking hackathon is to take new technology and ideas and apply these to create working prototypes that improve or even completely change the way banks interact with each other, with fintech companies, and most importantly with their customers. The wide spread of participants from such a variety of disciplines underlines the emphasis on “open banking” over the weekend. Petrichor, which designed a platform to allow customer engagement throughout their mortgage journey, with supports such as repayments in real time, home valuations and ideas on how to release equity in your home. Homeland, which designed a platform to make the home buying process as easy and transparent as possible, using a chatbot to help customers determine which houses they can afford and where. One of the central themes that teams worked on over the weekend was how to use data analytics, information sharing, and emerging technologies to support customers in their journey to buy their home. Ulster Bank can then combine these fresh perspectives and innovative uses of new technology, with its own expertise to guide home buyers in the most effective and helpful way. For the first time, this year’s Hackathon included a category for Ulster Bank staff to apply disruptive ideas and technologies to the organisation where they work every day, challenging them to think like third-party disruptors. This forms part of Ulster Bank’s new intrapreneurship programme, aimed at fostering and implementing entrepreneurship within the Bank. Growth Hub, a platform to match start-ups and new businesses who are struggling to get finance, with alternative lenders. Farm Assistant, a financial information and management tool for the agri sector, to help farmers collate and store their financial data. Teams had access to a host of supports at Dogpatch Labs, including banking APIs, engineering support and industry mentors. There was also support from Nile and ViewsDX and pitching workshops to help participants develop and create concepts, but also learn how to communicate their ideas to the judges.